A brilliant late free-kick by substitute David Lalrinmuana helped former champions Aizawl FC hold Kolkata giants Mohun Bagan 2-2 in an absorbing game of football at the Vivekananda Yuba Bharati Krirangan (VYBK) on Saturday in match 10 of the 12th Hero I-League. Aizawl thus picked up their first point of the campaign after an opening game loss against Shillong Lajong, while Bagan have now drawn both their opening encounters. Mapuia gave Aizawl the lead on the 29th minute, only to see it cancelled out later by a sublime strike from central defender Kim Kima. 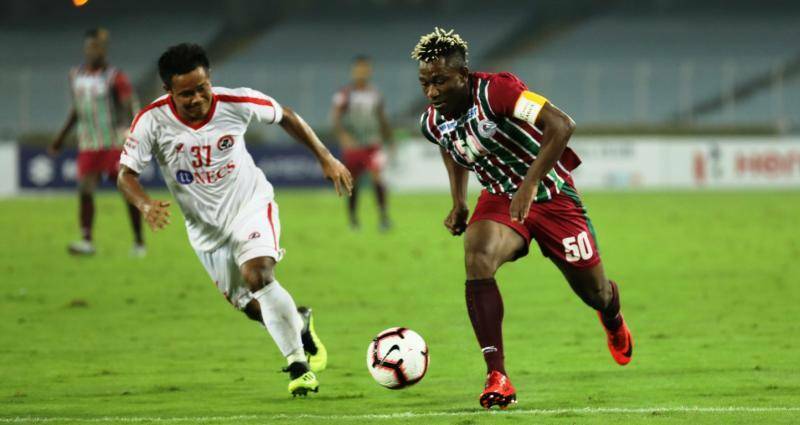 Haitian star winger Sony Norde, who was introduced in the 60th minute by coach Sankarlal Chakraborty for his first outing for the Mariners this season, scored off a sizzling solo effort to give Bagan the lead. It all looked stitched up for the home side before David’s stunning strike in injury time. The Haitian was also adjudged the Hero of the Match for his performance which lasted for 30 minutes plus injury time. Bagan began the game by giving a start to a fit-again Yuta Kinowaki in midfield, also his first outing this season, in place of Sourav Das who had started against Gokulam. The strike force remained the same with Ugandan Henry Kisekka and Cameroonian Dipanda Dicka up front. Egyptian Omar El Husseiny partnered Yuta in midfield while Pintu Mahata and PM Britto were to run the wings. Gift Raikhan replaced Ivorian frontman Leonce Dodoz with Mapuia and also understandably bolstered midfield by playing Kyrgyz Republic’s Bektur Talgat in place of forward Lalremsanga. Nigerian Kareem Nurain would continue to lead the back line with Alfred Jaryan marshalling the midfield. Both teams began with a lot of intent but it was Bagan who were slowly beginning to assert themselves into the game with fluid movements in midfield by Omar and Yuta. Pintu Mahata, who had a brilliant game was also being a constant threat on the left wing, to begin with. However, Aizawl struck quite against the run of play when in the 29th minute Albert got a loose ball inside the Bagan half and played it onto Mapuia ahead to his left. The Aizawl number nine received the ball with his back towards the Bagan goal, turned beautifully and after a couple of steps forward unleashed a low left-footer which beat an outstretched Sankar Roy in the Bagan goal. Sankar was also probably blinded as the ball came through defender Arijit Bagui’s legs. Bagan equalised in the 43rd minute when mainly, due to the labour of left wing back Abhishek Ambekar, they earned a corner on the left flank. Dicka tried to bring down the resulting Pintu Mahata floater on the far post, but the ball deflected off an Aizawl defender to Kim Kima who was left unmarked. He controlled the ball and then calmly curled a left-footer in the far top corner of the Aizawl goal. Bagan renewed their dominance in the second half and the visitors were particularly hampered by an injury to Nurain where he eventually had to be replaced and a couple of yellow cards to snatchers Bektur and captain Alfred Jaryan. At one stage Bagan had seven corners to Aizawl’s none. The game then took a turn for the better for the home side, with the introduction in the 60th minute of Sony Norde, much to the excitement of the home fans. He would show his artistry and class soon enough. On the 69th minute, receiving a ball from the Bagan midfield well outside the Aizawl box on the left flank, Sony left his marker Duatta for dead with a deft body swivel and touch and cut in with a burst of speed to find himself in front of Gurpreet in the Aizawl goal. A classy measured right-footed curler followed which went over the keeper and lobbed into the far corner to give Bagan a deserving lead. Thereafter Bagan, inspired by Sony, continued to pile on the pressure and created several chances but were denied every time by a dogged Aizawl defence. As the game looked done and dusted for Bagan, Aizawl earned a free kick about 35 yards out with two out of the four injury time minutes already played. David Lalrinmuana, who had come on in place of Bektur in the 70th minute, stepped up curled it past Sankar with a perfect right-footer to stun the home fans. The result puts Bagan in fifth place in the standings while Aizawl with their first point are in the eighth position.